Scunthorpe manager Stewart McCall has seen his side win their last four games. Sunderland face a trip to Scunthorpe this weekend - but what should they expect? 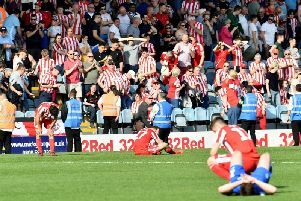 Jack Ross’ side recorded a comfortable 3-0 win over the Iron when the two sides met at the Stadium of Light back in August, but a lot has changed since then. Scunthope have a new manager for starters and have discovered some decent form in recent weeks. We take a closer look at the Black Cats’ next opponents ahead of their trip to Glanford Park. What system will Scunthorpe play? The Iron have predominantly played with two strikers this campaign, which has often left them exposed at the back. Only Rochdale (58) have shipped more goals than Scunthope (53) in League One this term. Yet the Iron have kept two clean sheets in their last four fixtures, despite playing an offensive 4-4-2 formation, in which the two wingers are given licence to attack. The side’s front four has remained consistent in recent weeks, with widemen George Thomas and Levi Sutton supporting strikers Lee Novak and Kyle Wootton. Who are Scunthorpers's key players? Novak is the club’s top scorer with 11 goals in all competitions, 10 in the league, and has been clinical in front of goal this term. Former manager Lee Clark, who worked with Novak at Huddersfield, has previously praised the forward for his ‘good awareness’ and ‘fantastic work ethic’. Against Walsall, last time out, Novak received one chance and took it, when he dinked the ball over goalkeeper Liam Roberts to score the winner. Another player who has been key for Scunthorpe this campaign is experienced defender James Perch. The former Newcastle and Wigan man has been deployed as a holding midfielder in recent weeks, taking the pressure off the players in front of him. Do Scunthorpe have any injury worries? Scunthorpe’s injury woes have eased in recent weeks but the Iron are still missing several first-team players. Rory Watson, Jordan Clarke, Josh Morris and Ryan Colclough all remain out after suffering long-term setbacks. Goalkeeper Matt Gilks is close to a return after playing for an hour during a behind closed doors friendly last week. Midfielder Matthew Lund was a late substitute in the 2-1 win over Walsall, after recovering from a degenerative bone condition. Who is Scunthorpe's manager and what can we expect from them? Stuart McCall took charge of Scunthorpe on August 27, following the sacking of Nick Daws four games into the new season. It took McCall three games to win his first match as Scunthorpe boss, a 3-2 win at Wycombe in the middle of September. McCall started his managerial career at Bradford in 2007, where he spent the next three years, before returning to Valley Parade in 2016. In between the two spells, McCall had a successful stint at Motherwell and spent a year in charge of Rangers. What form have Scunthorpe been in? Following a 2-0 defeat to Luton on Boxing Day, Scunthorpe dropped to 23rd in League One. Since then Scunthorpe have won their last four league games, defeating Wycombe, Peterborough, Coventry and Walsall. That run has seen McCall’s side rise to 15th in League One, six points clear of safety.